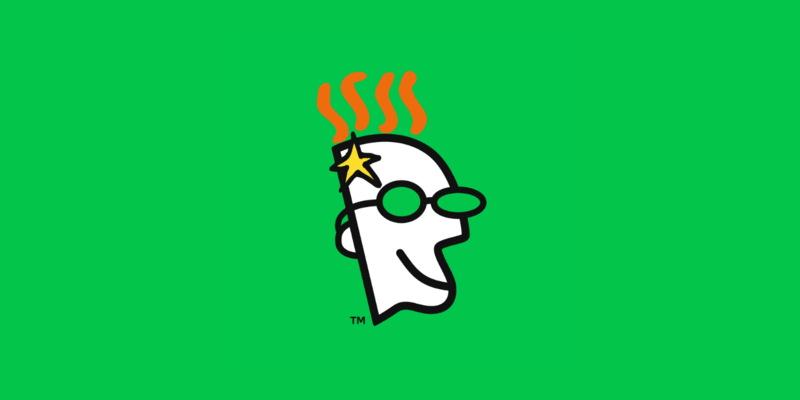 GoDaddy is one of the world’s most popular domain registrars with over 40 million domain names under its management. If you purchased your domain name through GoDaddy, you have two different options to point your domain name towards Kinsta (or any other host). You can either add a new A record, which is what this article focuses on. Or, you can use Kinsta’s premium DNS feature with Amazon Route 53 and change your nameservers at GoDaddy. In this article, you’ll learn how to add A record with GoDaddy. 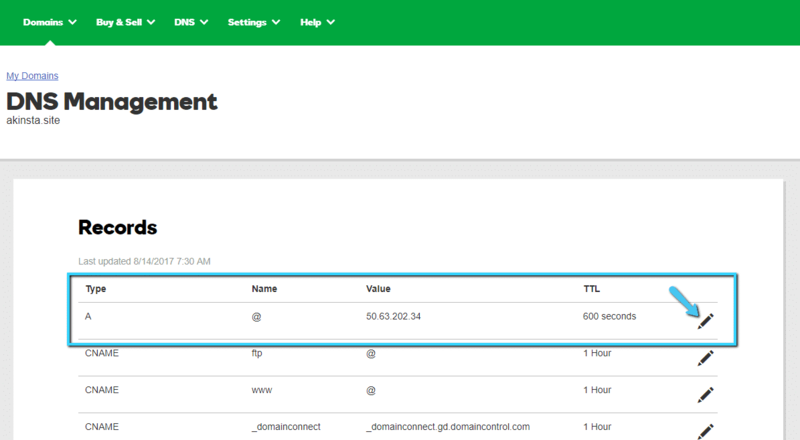 Because GoDaddy gives you two different interfaces for managing your domain names, we’re going to give you a separate tutorial for each interface. Much of the process is identical, but we’ll split it into two guides for clarity. You only need to add your GoDaddy A record one time, though. To help determine which interface you’re using, read the short section below. Then, you can go straight to the tutorial steps that apply to your specific interface. Which GoDaddy Interface Are You Using? 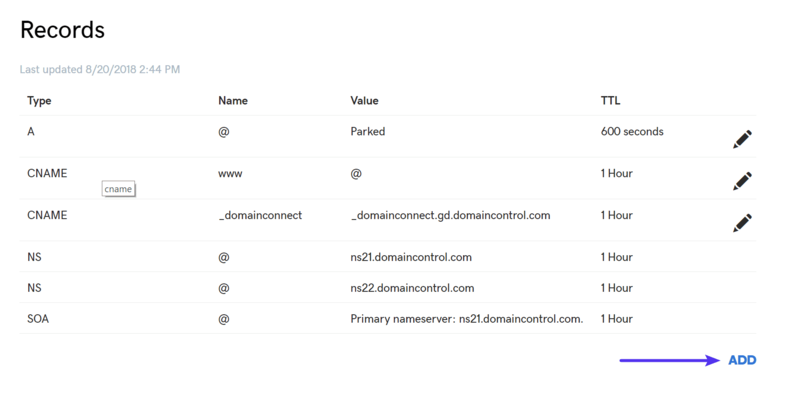 Card view – this is the default view and features each domain as a separate “card”. If desired, you can change between the two interfaces by using the marked icons in the top right of the page. Once again, these instructions apply to the card view interface at GoDaddy. You should now be in the DNS Management interface for your chosen domain. In the DNS Management interface, look for the Records section. If you don’t see the full Records section, it’s like because you’re already using custom nameservers. Click here to learn how to fix that. In the Records section, look for the A record under the Type column. It should be the first option in the list. And that’s it! You’re finished. These instructions apply to the advanced list view interface at GoDaddy. 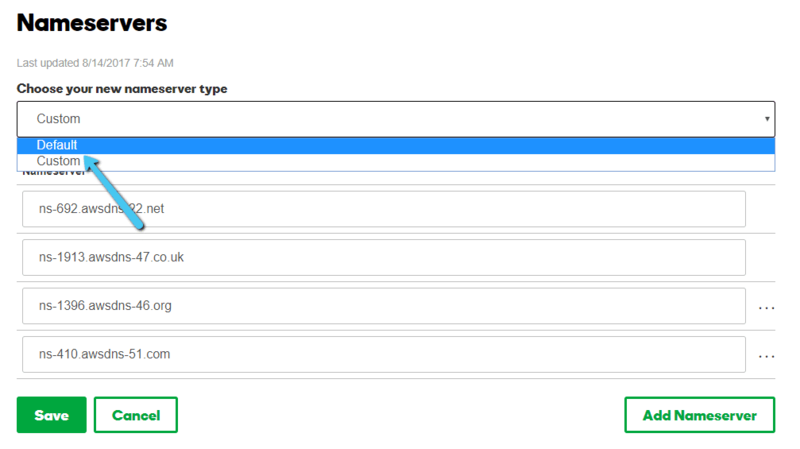 In the DNS Management interface, look for the Records area (click here if you don’t see the full Records area). Then, look for the IPv4 Address box. This IP address is what you’ll use for your A record. Below we’ll walk you through how to add an A record for a subdomain with GoDaddy. 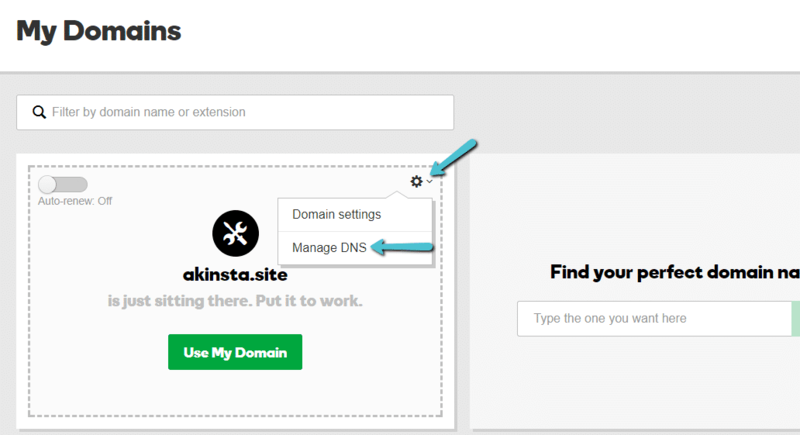 And don’t forget to add the subdomain to your site in the MyKinsta dashboard. What If You Don’t See the Full Records Section at GoDaddy? If you see that message, you’ll need to transfer your nameservers back to GoDaddy before you can add an A record. Then, Save your changes. You may need to wait a few minutes for the changes to take effect. Once they do, you’ll be able to add your Kinsta A record to GoDaddy.